Comply™ Foam Tips P-series offer the highest level of noise isolation with excellent in-ear retention. 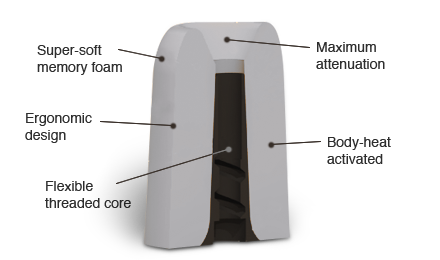 P-Series tips are made with soft memory foam technology with a tapered shape for maximum comfort. Maximum Noise Reduction: By sealing the ear canal against environmental distractions, you can enjoy music without raising the volume to compensate for external noise. Soft Comfort: Your body heat activates this unique breathable memory foam to create an ultra-soft experience, reducing irritation and fatigue. Stay-In-Ear Fit: Active lifestyles won’t be tripped up by this secure in-ear fit. Comply Foam dramatically increases in-ear retention by expanding to fill the ear canal. Enhanced Audio Performance: Hear your music the way it’s supposed to be heard, with all its highs and lows. Comply Foam seals the ear canal and funnels in pure sound to maximize the listening experience. For Westone UM Series and W Series IEM's.